Join the GRU Graduate Student Organization for the Ticker Trot 5K as the raise funds & awareness for the American Heart Association. The walk will be Saturday, March 16 at 9 a.m. the Augusta Canal at Lake Olmstead. Early registration is $25 before March 10; $30 after that date. Sign up at http://www.active.com/running/augusta-ga/ticker-trot-2013. Prizes will be awarded to top finishers. Georgia Regents University’s 45th Annual Lyceum Series has two performances remaining in the 2012-2013 season. The New York Gilbert and Sullivan Players will present “The Pirates of Penzance” at 7:30 p.m. Monday, March 4, and the Golden Dragon Acrobats will perform at 3 p.m. and 7:30 p.m. Saturday, March 30. All shows will be held at Maxwell Theatre on the Summerville campus. “The Pirates of Penzance” is the story of Frederic, whose nurse was told to apprentice him to become a pilot when he was a young boy. However, she heard the word incorrectly and apprenticed him to a band of pirates, which begins the shenanigans. The musical theater production features pirates and Victorian maidens as they make a boisterous romp over the rocky coast of Cornwall. Performed in its original format with costumes, sets, a large cast and live orchestra, “The Pirates of Penzance” is directed and conducted by Albert Bergeret with choreography by Bill Fabris. The performance is made possible in part by a grant from Georgia Presenters and the Fox Theatre Institute. The Golden Dragon Acrobats represent a time honored tradition that began more than 25 centuries ago, the rigorous art of Chinese Acrobatics. The group is recognized throughout the United States and abroad as the premiere Chinese acrobatic touring company of present day. Originally from Cangzhou, Hebei province, in the People’s Republic of China, the Golden Dragon Acrobats have toured for more than 30 years to international acclaim, traveling to over 65 countries on five continents and to all 50 states. The 25 acrobats are athletes, actors and artists who have trained since childhood. World-renowned entertainer Danny Chang and choreographer Angela Chang combine award-winning acrobatics, traditional dance, stunning costumes, ancient and contemporary music and theatrical techniques to present a show of unique skill and beauty. To purchase tickets, call 706-667-4100 or visit augusta.universitytickets.com. Tickets are $20 for the general public and $10 for children 17 and under. GRU faculty and staff can attend the shows for $10, and admission is free for GRU students. On Thursday, Feb. 21, at 7:30 p.m. in the Maxwell Theatre, the Georgia Regents University Orchestra, under the direction of Dr. Martin David Jones, and the GRU Wind Ensemble, under the direction of Dr. John Wojcik, will be giving a concert. Dr. Wojcik and faculty member Kelly Odell will be featured soloists with the GRU Orchestra in Aaron Copland’s “Quiet City” for Trumpet, English Horn, and Orchestra. Admission is $5 and free with valid JagCard. Six students in the Department of Sociology, Criminal Justice, and Social Work will present at the Southeastern Undergraduate Sociology Symposium (SEUSS) at Morehouse College in Atlanta GA Feb. 22-23. Tuition rate increases are determined each year by the University System of Georgia (USG) Board of Regents. Georgia Regents University (GRU) approved Fall 2013 tuition and fees will be announced after April 1, 2013. Tuition and fees for summer 2013 semesters will not be affected by the consolidation and GRU is working with the Board of Regents to minimize the impact of increases for Fall 2013 and beyond by increasing the rates gradually over time. Existing ASU students in non-health sciences programs will continue at the Fall 2012 ASU rate plus the standard USG Fall 2013 increase. In other words, rates for currently enrolled non-health sciences students will not be affected by the consolidation. Effective Fall 2013, rates for new freshmen and transfer students in non-health sciences programs will increase slightly in addition to the standard USG Fall 2013 increase. This rate will also apply to pre-nursing students currently enrolled at ASU who are accepted into GRU’s BSN program. Effective Fall 2013, rates for returning GHSU and newly admitted GRU undergraduates in health sciences programs (other than current ASU pre-nursing) will continue at the Fall 2012 GHSU rate plus the standard USG Fall 2013 increase. In other words, rates for these students will not be affected by the consolidation. Effective Fall 2013, GRU will implement a “Finish in Four” incentive for undergraduate programs that will apply the full-time tuition rate to students who enroll in 10 or more credit hours per term. This completion incentive will apply to any of the rates described above. Details for Fall 2013 tuition and fees will be published as soon as they are BOR approved after April 1, 2013 at gru.edu/tuition-fees. For questions related to tuition and fees, please visit our FAQ page or call 1-855-TUI-TION (588-4846). Augusta State senior Natalie Wille shot a 76 Tuesday in the third and final round of the UCF Challenge at Red Tail Golf Club. Wille tied for fifth place individually at 1-under 215 and paced the Lady Jaguars to a ninth-place finish at 890 (+26). The tournament marked the opener of the 2013 spring schedule for the Lady Jaguars. ASU junior Casey Kennedy joined Wille in the top 20 with a tie for 12th at 2-over 218 (67-77-74). Junior Christine Duschek-Hansen tied for 54th after an 81, while senior Marit Bjerke enjoyed the squad’s low round of the day with a 1-over 73. She tied for 64th and fellow senior Julia Stalbro posted a final-round 80. Ninth-ranked North Carolina, the highest-ranked team in the field, cruised to a 17-shot victory over No. 30 Tulane. Tournament host UCF was third, followed by Miami and No. 18 Virginia. The three-day, 54-hole event featured seven teams ranked in the top 50 and included UCF, ASU, Coastal Carolina, College of Charleston, East Carolina, Georgia State, Kennesaw State, Louisville, Miami, Mississippi, Missouri, North Carolina, Oregon State, South Carolina, South Florida, Texas State, Tulane and Virginia. Full-field results of the event are available at www.golfstat.com. In their inaugural season, the Augusta State Men’s and Women’s Outdoor Track & Field programs beefed up their spring schedule on Monday by adding a dual meet with Paine College for Friday, Feb. 22. The Jaguars will face Paine College at Laney Stadium for ASU’s first outdoor track and field event of the season and the school’s first in program history. The meet will begin with eight field events starting at 1:25 p.m., before nine running events commence the day with the final event slated for a 2:55 p.m. start. Despite being in its first season, ASU has some familiar faces to add to outdoor track and field. Ten of the 13 men’s cross country runners will be competing in track and field this season, along with 11 newcomers. The women’s track and field team welcomes five members from the cross country team to go along with their 13 other competitors. Weather issues affected five teams this past week, prompting changes to their schedules. Baseball’s non-conference matchup with the currently 5-1 Erskine Flying Fleet will be rescheduled at a later date. Softball’s doubleheader with Erskine will be played Tuesday, February 26 at 2 and 4 p.m. at Erskine. Both tennis squads were set to take on Georgia College to open their Peach Belt Conference slates, but will head to Milledgeville Tuesday, April 2 to take on the Bobcats at 2 p.m.
WOMEN’S TENNIS at UNC Asheville, Asheville Racquet Club Downtown, Asheville, N.C., 12:00 p.m.
SOFTBALL at Erskine, Erskine Softball Complex, Due West, S.C., 2:00 p.m. BASEBALL at Anderson, Anderson Memorial Stadium, Anderson, S.C., 3:00 p.m.
WOMEN’S BASKETBALL at Columbus State, Lumpkin Center, Columbus, Ga., 5:30 p.m.
MEN’S BASKETBALL at Columbus State, Lumpkin Center, Columbus, Ga., 7:30 p.m.
SOFTBALL at Charger Chillout, vs. Alabama-Huntsville, Decatur, Ala., 3:00 p.m.
SOFTBALL at Charger Chillout, vs. Barry, Decatur, Ala., 5:00 p.m.
WOMEN’S TENNIS HOSTS Columbus State, Newman Tennis Center, Augusta, Ga., 1:00 p.m.
MEN’S TENNIS HOSTS Columbus State, Newman Tennis Center, Augusta, Ga., 1:00 p.m. BASEBALL HOSTS Armstrong Atlantic, Lake Olmstead Stadium, Augusta, Ga., 2:00 p.m.
WOMEN’S BASKETBALL at Georgia Southwestern, Storm Dome, Americus, Ga., 1:30 p.m.
MEN’S BASKETBALL at Georgia Southwestern, Storm Dome, Americus, Ga., 3:30 p.m.
SOFTBALL at Charger Chillout, vs. North Alabama, Decatur, Ala., 3:00 p.m.
SOFTBALL at Charger Chillout, vs. Charleston, Decatur, Ala., 5:00 p.m. BASEBALL HOSTS Armstrong Atlantic (DH), Lake Olmstead Stadium, Augusta, Ga., 12:00 p.m.
WOMEN’S TENNIS HOSTS Georgia Southwestern, Newman Tennis Center, Augusta, Ga., 1:00 p.m.
MEN’S TENNIS HOSTS Georgia Southwestern, Newman Tennis Center, Augusta, Ga., 1:00 p.m.
SOFTBALL at Charger Chillout, vs. Florida Tech, Decatur, Ala., 11:00 a.m.
SOFTBALL at Charger Chillout, vs. Indianapolis, Decatur, Ala., 3:00 p.m. Under the direction Dr. Heather Abdelnur, Associate Professor in the Department of History, Anthropology, and Philosophy, GRU history majors Joachim Veihman, Meaghan Borquez, and Joseph Willard, had their panel accepted as one of only two undergraduate panels allowed to present their research at the Americas Council Annual Conference held at Georgia Perimeter College. Borquez also won the annual student paper contest, it was the only prize awarded at the conference. Lindsey Waller, a Bachelor of Science in Nursing student in the College of Nursing, is one of more than 100 nursing students from across the country chosen to participate in the Mayo Clinic Student Nurse Externship Program. During the experience, she will be assigned an RN preceptor and will gain valuable hands-on experience at the Rochester, Minnesota hospital. The highly competitive program, now in its 47th year, is a 10-week paid externship that challenges rising junior nursing students to expand their knowledge of nursing and critical thinking skills. This is the second consecutive year that a GRU nursing student has been selected. Honors Program students presented at the 30th Annual Georgia Collegiate Honors Council Conference, Feb. 8-9 in Statesboro, Ga. The following students presented at the conference: Laura Reid, A Glass Half Full: Predicting and Preventing Posttraumatic Stress Disorder; Mi’esha Frierson, Role of Parental Absence, Adult Attachment, and Personality Styles on Relationship Satisfaction; Audrey Lewis, (Supposedly) Wicked Women: The Development of the Role of the Voudou Priestess in Early New Orleans; Brittney Laufer and Jacob Baggett, Renaissance Humanism; Chelsea Hargrove, Psychology in Interior Design: The Effects of Color on Mood and Behavior; and Wesley Milam and Emma Echols, The History of Chess. Save the Date for Homecoming Week 2013, Feb 18-23. We believe in the Jaguar Nation! Georgia Regents University’s student newspaper, The Bell Ringer, received 14 awards at the Georgia College Press Association Awards Banquet in Athens, Ga. on Feb. 2. 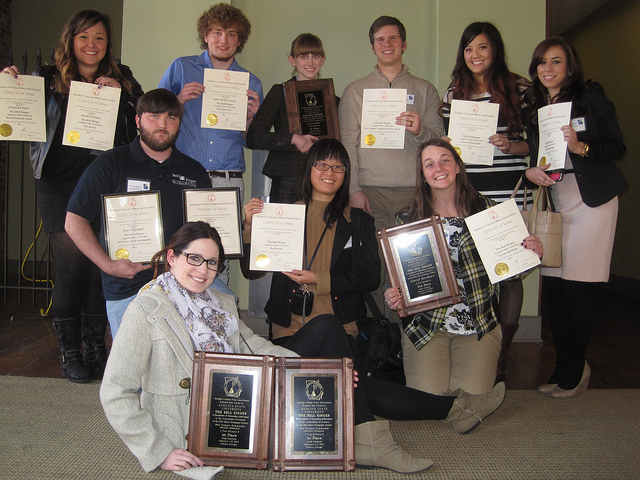 The publication competed against college newspapers across the state and won one more award than last year’s record. Among the awards were five first-place honors, including Best Editorial or Editorial Series, Best Campus Community Service – Features, Best Campus Community Service – Editorial and Most Improved. The paper also took second place in the prestigious General Excellence category, said Faculty Adviser Matthew Bosisio. Individual award winners were Travis Highfield, first place for investigative reporting; John-Michael Garner, second place in best sports story; and Jacquelyn Pabon, two second-place awards for best sports photograph and best review. In addition, The Bell Ringer won second place for its website. At the conference, 10 students from The Bell Ringer staff had the chance to view student newspapers from across the state and attend educational seminars. The Bell Ringer is 55 years old and is published biweekly. The staff includes 11 students who receive a stipend for their work and about a dozen additional writers.